Everyone loves Mediterranean food. But few can say what makes the soul-comforting, understated peasant food of Portugal distinct from that of its neighbors. The abundant use of legumes and leafy greens in its hearty soups and stews? The unusual combinations of meat and shellfish? The wine and garlic marinated braises? The easy seafood preparations? Or, perhaps, the luscious, egg-sweet desserts, from light meringue puddings to rich, sweet breads? Peppered with a lifetime of anecdotes from a passionate cook's years in a Portuguese culture, Portuguese Homestyle Cooking draws us into an immigrant kitchen where traditional culinary methods were handed down from father to daughter, shared and refined with the help of the family and friends who watched, chopped, and tasted. 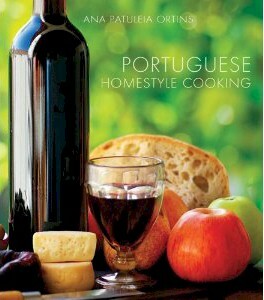 The recipes in Portuguese Homestyle Cooking are of dishes prepared as they were in Portugal-but with the measurements standardized and perfected and the commonly used ingredients and methods fully explained. Novices and experienced chefs alike will enjoy preparing these savory dishes. A first generation descendant of Portuguese immigrants from the Alto Alentejo region of Portugal, Ana Patuleia Ortins grew up with the ethnic lore and traditions attached to the food of her ancestors. She holds a degree in culinary arts and teaches Portuguese cooking in her own kitchen and at local colleges. 9” x 10 1/4” • 256 pages • full-color photos.